Last week, the media was all over Paul Ryan’s visit to an event with the American Association for Retired People, gleefully reporting that he was booed. The media treated the whole affair as if the AARP was a non-partisan organization. But, the truth is, the AARP is no more non-partisan than any organization carrying water for the Obama administration. This characterization is absurd. It presents the AARP as a venue that might not boo any proposal of the reform of an over taxed government program! AARP is solidly on the side of big government – it was a leading proponent of Obamacare — and will brook no truck with anyone talking of reforming anything. Of course they’ll boo Paul Ryan. But The Hill does not even give all the facts in its report on Ryan’s visit. Nowhere does the paper mention that AARP made $2.8 billion off its support of Obamacare, for instance. If the reader understood this, he might not be surprised that AARP would resort to booing Ryan. …the AARP aggressively, and successfully, lobbied to keep Medigap reforms out of Obamacare, because AARP receives a 4.95 percent royalty on every dollar that seniors spend on its Medigap plans. Reform, DeMint estimates, would have cost AARP $1.8 billion over ten years. Then there is the insurance windfall that AARP makes off Obamacare that amounts to another $1 billion. 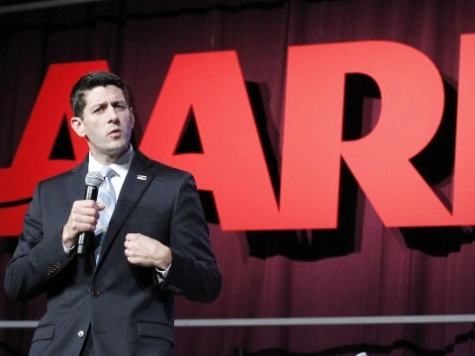 The media should not report the boos Paul Ryan received from AARP as if they are news worthy of note. On the other hand, at that same AARP event, the same news outlet, The Hill, reported Obama’s welcomed reception as if it was nothing short of the epitome of policy success. What was missing from The Hill’s report of Obama’s appearance at the AARP gathering? You guessed it, any mention of the $1 billion that AARP will make off its own insurance program thanks to Obamacre. With a $1 billion windfall, it’s no wonder they were so happy to see their patron in chief! But, The Hill wasn’t the only news outlet that was so happy to report Ryan’s booing. Any search of the news about the AARP event will net similar results — and similarly neglectful reportage — of the event. While just a small example, the treatment that Ryan received by the Old Media over his appearance at the AARP event was typical of the negative and uninformative coverage that the whole media establishment has afforded Romney/Ryan throughout this campaign.